I thought I would make a post about how I've found our first week with a newborn baby. As you probably know, we are first-time parents, so this last week has been completely life changing for us. Well, it's been a whirlwind, that's for sure. Our life has literally been turned upside down, for the best possible reason. We are so incredibly happy that our baby girl is finally here and healthy. The past week has been a complete blur in a lot of ways, and I can't actually believe how quickly it's gone. We were always told that the newborn days pass by with a blink of an eye, and I can finally appreciate that. I just want to soak up as much of Edith as I possibly can. Now, I'm sure most people have heard of the baby blues. I'd be lying if I said that I wasn't worried about them hitting, but in all honesty, I feel more myself than ever. Is love an emotion? Because that's all I've been feeling. I feel like I've been in a 'baby bubble' and feeling so thankful for it. Sometimes I look at Edith and count my lucky stars that she's mine and I do get a wave of overwhelming love that just takes over. How can someone so small, hold my heart so tighyly? As much as I love my baby girl, I'm also craving sleep...big time. 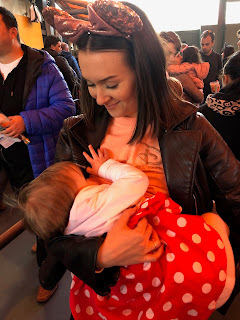 We've had a lot of advice, telling us to 'sleep when baby sleeps', but believe me, it's so hard when you either want to cuddle your baby all of the time, or just watch them sleep. I'm still working on this piece of advice, because the tiredness is starting to creep in! Daytime is a dream, but nighttime is something else. Interrupted sleep isn't kind to anyone, especially when breastfeeding. It's very demanding and can leave you feeling very sleepy indeed. 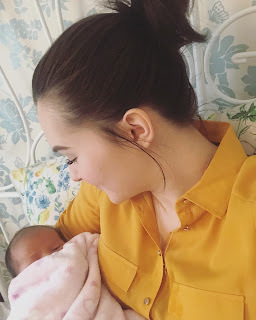 Now, I will be writing a separate post about my breastfeeding journey so far, so please bear with! 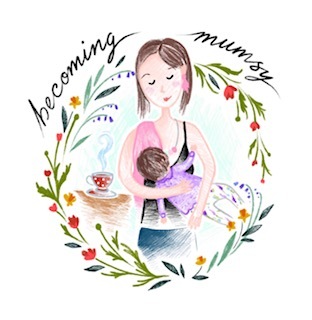 What I will say though is that breastfeeding is a pretty gruelling experience. It's hard, it's demanding, but watching Edith nursing and cuddling into me, really does fill me with a sense of pride that I didn't know existed. I'm so proud of my body and what it continues to do for my baby. So, like I mentioned in my about me section, I have three cats - Loki, Thor and Dobby. I had lots of people telling me to be careful with the cats around Edith, what with her smelling like milk, etc. If I'm honest though, they just look at her as if she's some kind of alien and then head the other way away from her. They aren't keen on the crying, or the fact that they now get locked out of our bedroom at night! We have, of course, had to make some adjustments to the house. Some bigger than others, but the main one being locking the cats out of our room during the nighttime, like I just mentioned. Other than that, the rest of the house currently looks like a battlefield filled with baby items that were once neatly waiting for Edith to use them. I find it crazy how such a small person can cause such chaos, in the best possible way, of course! Like I've said before, we are in baby bubble, and I am absolutely loving it. We waited and suffered heartbreak for Edie, and I can wholeheartedly say that she was 100% worth all of it. I love soaking up as much of her as I possibly can, but I'd be lying if I wasn't looking forward to all of our future adventures.